Where’s the value for medical imaging AI? Summary: products that add clinical value for the referrer unlock significantly higher value per study than tools that improve radiologist efficiency. As more AI based clinical applications approach market launch, there is increasing interest in how the companies that develop these algorithms should charge for their products. Any product or innovation in medicine seeks to improve patient outcomes and/or decrease the cost of care – but what is that worth? To tackle that question we need to map out the value chain for a particular condition. 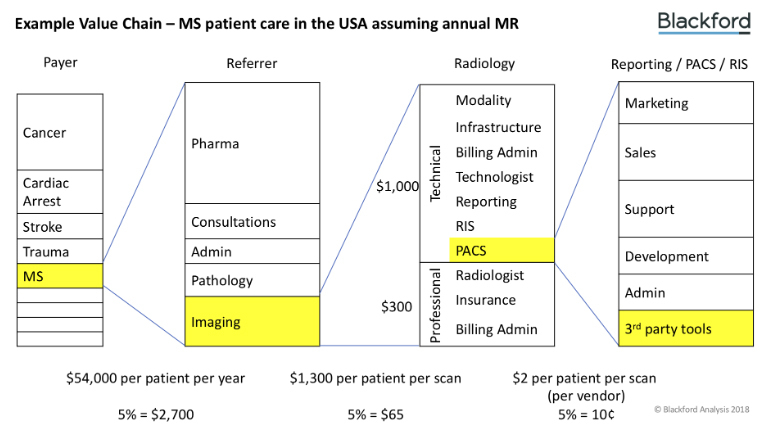 This diagram is a framework that can be used to help think about value in the US radiology market, in this case for Multiple Sclerosis (MS). In the case of MS, if your product is able to help a neurologist determine the correct disease modifying therapy it’s likely to have much higher value per study than if it helps a radiologist detect a lesion. Taking this a step further, if you can demonstrate reduction in cost over a large population then perhaps there is an even larger opportunity with the payer. Although it’s based on MS, it can be replicated for lesion tracking driving value for oncologists or, likely, any other condition that medical imaging addresses. Of course, the other dimension for a revenue model is volume – how many times per year per customer is the product going to be used? If a tool is useful for every study at a site (dose monitoring, de-noising, triage, general registration etc.) then a low value per study could be acceptable – but expect to gain cents rather than dollars per study. Such products also face difficulties finding an internal champion – as all product managers know, it’s better to be everything to someone than something to everyone. Selling into hospitals is an expensive and slow process – given the slim pickings identified above, efficiency in go to market strategy is essential. Our Blackford Platform combines multiple 3rd party products into a single platform, reducing cost of customer acquisition and sales / deployment timescales for partners and simplifying acquisition, deployment and maintenance of multiple products for clinicians. The diagram considers the treatment of MS in the US. The figures are rough estimates and will vary between location, practice environment and payer but the relative scales should be correct. I’m sure the value chains for other conditions are similar. There’s no “new money” in healthcare – In almost all cases, paying a new supplier requires not paying an existing supplier. I’ve used 5% of total cost at each stage as a rough and ready reckoner of the upper limit of how much might be available for an innovation, that may be too optimistic. The spend per patient per year increases as you move to the left hand side of the image. The aggregate technical component of reimbursement for an MR w/wo contrast is somewhere around $1000, and within that cost IT provision (RIS, PACS, Reporting, AV, all other IT) is around $5 per study. Current PACS pricing averages out at around $2 a study, reporting and RIS perhaps a dollar each. The professional/practice component associated with reporting that MR comes to something like $300. It’s important to note that this might not be going through the hospital’s books – often a radiology group is contracted by the hospital to provide reading services, and the hospital sets a turn-around-time standard that must be met. Hence the hospital owns the IT infrastructure, and to a certain extent the radiology group just has to use whatever environment they are provided with. The average cost of an MS patient to a payer is $54,000 per year. If a hospital or health system can make themselves more attractive to patients by demonstrating an improved quality of care, they are likely to increase the number of patients they treat and therefore drive greater reimbursement. How this value is collected depends on the choice of pricing model, and there are plenty available… Signify Research recently published a great summary of pricing models for radiology AI products. The dream for many clinical applications is that some form of direct reimbursement will become available for use of their product. Some companies have had success under CPT 76376 & 76377 (general codes for 3D post processing), but specific codes are a long-term project (3+ years) requiring significant investment to build evidence and consensus and non-trivial work to support claims – see reimbursement resources for Health Professionals for reimbursement of Heartflow to get an idea. If your product “improves radiologist efficiency”, you’re likely to have to be sold as a component of the PACS, RIS or Reporting system. The approximate cost per study of this combination of IT tools is $5 per study, with perhaps $1.50 – $2 per existing radiology IT vendor – all of these are now commoditised products, and margins are slim for add on capabilities. If your product “reduces radiology load” by performing CADx, perhaps you’re able to eat into the radiology reimbursement although you may have difficulty persuading a radiologist of that… I’m not sure if any products have actually achieved this, the cost of the PMA is likely prohibitive (see also the rise and fall of CAD, 10-15 years ago). If your product “reduces the risk of misdiagnosis”, you may reduce risk for the hospital but are unlikely to reduce the clinician’s malpractice insurance. It’s a nice claim to make but there is likely no financial compensation for the product. Pricing for solutions that do not yet have, but need, regulatory clearance tends towards zero and is hard to recover from at individual sites – I’m yet to see a medical image analysis company successfully apply a “freemium” model. If you would like to discuss this framework and how it applies to different products, contact us.